Rose Varieties Floribunda (FL) This type of rose produces a mass of flowers on each stem and generally grows between two to four feet tall. It looks best planted in masses. Hybrid Tea (HT) This type of rose is the classic single stem rose used for cu ing. It generally grows to about four to six feet tall. Grandiflora (GR) This is the biggest type of rose. It has larger roses that are borne on single and multi stems. It will generally grow about six to eight feet tall and does best placed behind the shorter types. Shrub (SH) This type of rose tends to be round, rather than vase- shaped. It takes on a shrubby appearance and produces many flowers on one stem like a floribunda. High disease resistance. Groundcover (GRC) These types of roses typically grow wider and lower than the above types. They have a long blooming season and are resistant to disease and are easier to care for. Not a cu ing type rose. Climbing (CL) This type of rose grows like a vine and does best with support. They do really well on trellises. Ask about pruning techniques. 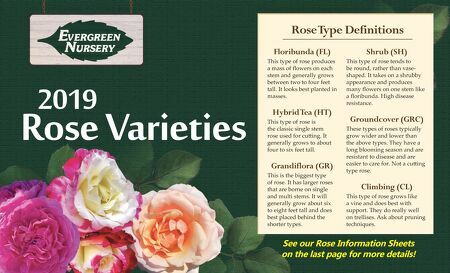 Rose Type Definitions 2019 See our Rose Information Sheets on the last page for more details!